Many people wonder how to catch a ghost on camera; do you need a paranormal camera or will a regular camera work? Although ghost hunting is nearly 2,000 years old and dates to the first century, ghost photography is fairly young, circa 1861. Today, ghost photography remains an important tool for paranormal researchers because access to affordable cameras allows even the newest investigator to capture and view paranormal activity. Regardless of how long people have attempted to record paranormal phenomena on film, unpredictability remains the challenge of ghost hunting. Witnesses can experience unexplained activities week after week at a site but when the ghost seekers arrive, everything goes quiet. No one understands what triggers a ghost's appearance, but preparation is key to being in the right place at the right time with the right photographic equipment. In order to improve the odds to capture a ghost on camera, select a location that has been reported as haunted, or where someone has experienced unexplained phenomena. Check with a local historical society about reputed local haunted locations. Join a ghost investigation group or attend nearby ghost hunts, tours, or conferences. Ask current residents of buildings: many people will share their stories and experiences if approached with sincere interest and courtesy. Read old newspapers since hauntings were often reported, but the events were forgotten over the years. Research books about local hauntings that are published by a number of presses, including Arcadia and others. 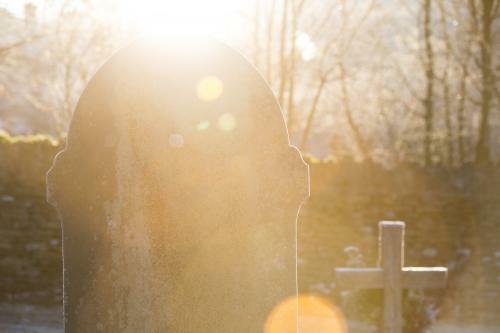 Although films and television shows depict teams investigating and photographing haunted spaces, it is imperative to request and receive permission before entering private property, including cemeteries. Nighttime investigations can end with criminal citations for trespassing, police intervention, or angry neighbors. 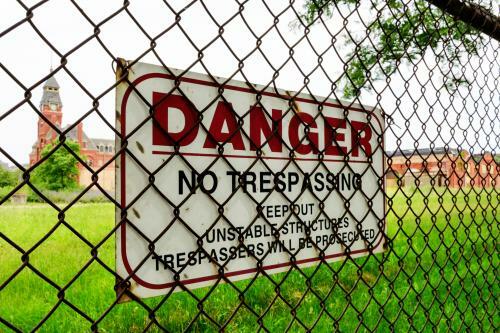 In the US, even abandoned buildings have owners of record, so do not enter a site unless you have verbal or written permission to do so. Likewise, never photograph haunted places alone and always tell someone where you are going. Basic photography equipment for capturing ghosts can run you under $100 or into the thousands, but the good news is you can find decent photography equipment to suit most budgets. Of course, if there will be a group taking photographs, you will probably have a variety of cameras and equipment to share and to try. There are different types of cameras that can be used to photograph ghosts, but all are based on the idea energy can be detected. Infrared (IR) cameras or night vision cameras detect images using light from a higher frequency range, which is the near infrared region and closest to visible light. These are the green figures seen in ghost hunting shows or in night vision goggles. Thermal cameras create images from heat. They detect radiation from the far infrared region and interpret it in colors like red, green, or yellow based on the object's temperature (infrared range emitted by an object at or near room temperature). 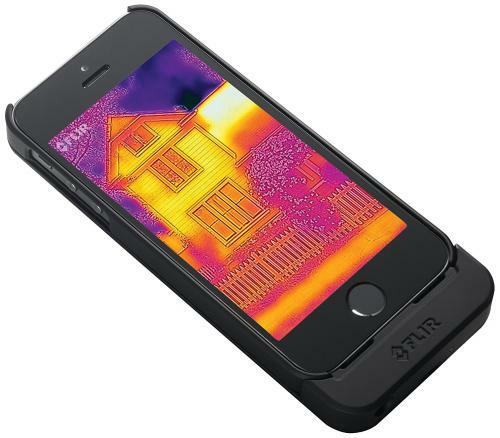 FLIR is among the best-known providers of thermal imaging cameras, including an iPhone version for ease of use. The cameras pick up subtle differences in temperatures, allowing the user to track an anomaly's movement. Fluke thermal imaging offers a downloadable guide to selecting the best camera for investigation needs. Full spectrum cameras detect visible, infrared, and ultraviolet wavelengths (the EM or entire light spectrum). GhostStop offers cameras selected for investigations. These cameras have been modified and are unsuitable for general daylight photography. Non digital cameras use film to record images, and digital cameras use pixels. Using both types of cameras during an investigation can provide excellent evidence and coverage. Tripods let you take still photographs without worrying about creating false effects on film. You may also want to take into account the weight of a camera: holding a three-pound camera steady may best be accomplished with a tripod. Gorillapods are lightweight and extremely flexible tripods that are easy to transport and set up. 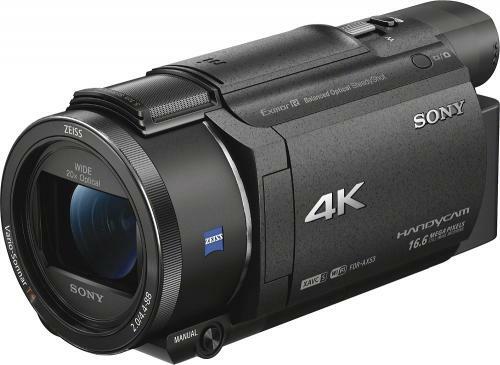 They can be configured in many shapes and fit digital cameras and camcorders. Their weight and size make them suitable for use on tables or in areas with limited space. 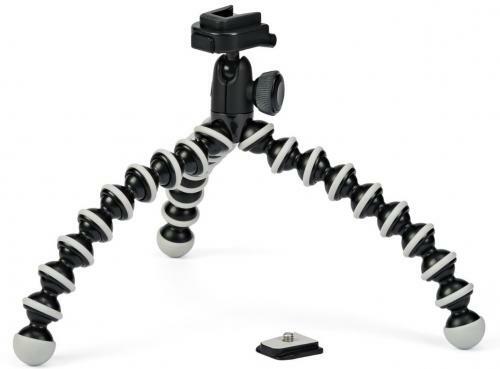 The GhostStop mini-tripod can be twisted around pipes, table legs, or other supports, allowing the photographer to achieve extensive room coverage from high angles. There is also a magnetic version that attaches to metal mountings like pipes or doorframes. Travel tripods are easy to carry and store, and there a variety of styles available beginning around $20. They can be adjusted for heights up to six feet and are easy to set up. Not all cameras will attach directly to a tripod, and you need to determine if you require an additional mount (sometimes called a "foot"). Mounts can revolve 360 or 180 degrees, and at least one style, the Puck, has built-in IR lighting. 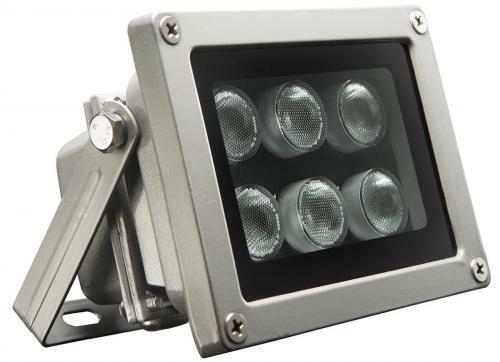 External IR lights are necessary to give your camera a boost, so look for sturdy lights that are easy to use. Always check beforehand to see if the photography site has active electrical outlets and if not, bring along an external power source. Not all cameras are IR enabled - some have a blocking filter, so IR lights won't have much of an effect here. If you plan to use external IR lights, make sure your camera doesn't have an IR blocking filter. IR lighting systems can be attached to a tripod, placed on the floor, or wherever lighting is required. Be careful with placement, since the lighting can bounce back, and give a false image in the photo. Camcorders take both still photographs and videos and come in IR (night vision) or full spectrum. In addition to a still camera, a ghost photographer will want to have a camcorder with night vision capabilities. While cameras and cell phones can do the same, you may sacrifice quality for convenience. When a camcorder is static, it means the camera is left in one place (on a table, or attached to a tripod). Camcorders attach to tripods with mounts, although it is possible to use duct tape or bungee cords. A static camcorder may be more likely to get knocked over in the dark, so taping the tripod to the floor may save some headaches (and repairs) later. The Panasonic Ultra offers outstanding video quality as well as Wi-Fi capabilities, which are handy when reviewing recordings. Sony's HandyCam is a standard at many ghost investigations. It is durable and simple to use. Bring along extra batteries and extension cords: cameras and cold rooms wear down batteries quickly, while some investigators claim spirits will drain batteries while attempting to manifest. While digital cameras are go-tos for most ghost hunters (after all, who likes fiddling with film in the middle of an investigation), you should bring along an instant photo camera, like the Fujifilm Instax, or a 35mm film camera with 400 to 800-speed film. You are less likely to make mistakes in interpretation if you use different types photography techniques together. Use a flash with instant cameeras and 35mm cameras in low light situations, but the results will depend on the lens, light, ISO, and distance. Practice night shots at home and get a sense of the camera before heading out on an investigation. Do not smoke or vape when taking ghost photos. The smoke/fog can interfere with the photo or appear as a shape, and it will take time to disprove the figure. When taking a photograph, take a deep breath in and hold it before you snap the photo. Breathing out, particularly in cold or humid environments, can create a mist that appears in your photo, which may generate false positives. Before beginning a ghost hunt, check the building for bats, insects, birds, open windows, animal droppings, and other indications you might not be alone. The quick movement of an animal or glowing eyes caught on film can confuse even the most experienced photographer. Check for camera straps, jewelry, scarves, or other items that could move or drop into a photograph. The ISO indicates the film sensor's sensitivity to light. ISOs of 800+ should be used for dark rooms and night filming. Stand near windows with the lights off and see whether traffic throws odd shadows on the walls before you begin filming. Use a lower aperture (F-stop) setting on the camera when filming in the dark. This will allow more light to enter the camera. Avoid blurring in the image by using a cable release and tripod. Camera settings vary by camera, photographer, and conditions but when it comes to ghost hunting, there are few basic things to take into account. A slower shutter speed will allow more light to enter the camera, but you will need to hold the camera steady so you don't get blurs or grainy photos. Some ghost hunters avoid using a slow shutter speed since the higher speeds will yield darker, less grainy results. This tutorial on camera settings, including shutter speeds, ISO, and aperture offers details for capturing movement. Dusty or wet conditions, flying insects, hairs, and snow all contribute to creating "orbs" or "dorbs" (those ghostly blobs of light that are caused by dust or other materials on the lens or sensor). While the marks could be paranormal, it's best to eliminate any real life possibilities by taking care of the camera and equipment. Before an investigation, carefully change and clean your lens in a relatively dust-free setting (not outside or in a haunted building). For 35mm cameras, store the lenses inside their containers and a case. Have your digital camera's sensor cleaned professionally at least every six months or after especially heavy usage. If you can't eliminate dust orbs, you may have to replace your lens but get a professional's opinion first. Lens flare occurs when light from any position ahead of the camera skims across the lens and creates spots, streaks, or a ghostly glare or "fog" in the picture. It occurs even more often in a dark environment where there's any source of light ahead of the camera. Be careful that headlights from cars passing by don't introduce anomalies. Shade the lens with your hand (if photographing in daylight), and don't shoot directly into the sun or a light source. It is no surprise to ghost hunters: ghosts tend to do what they want, when they want, but it may be possible to attract them. Talk to them and ask them to make their presence known. 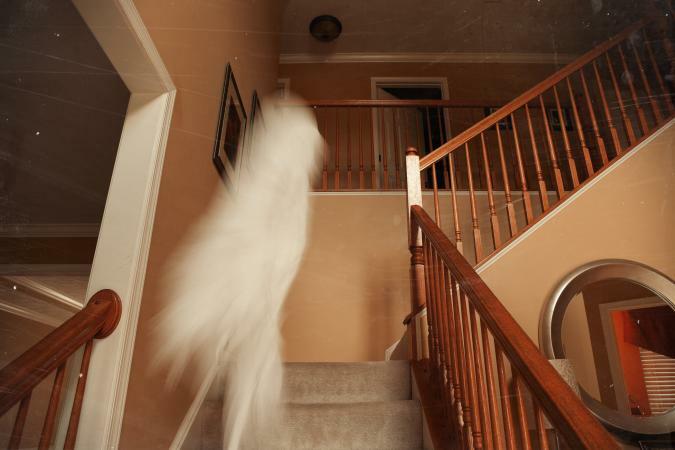 It is supposed to take a lot of energy for a ghost to manifest, so a photographer may end up with only an outline or a partial figure on film. Use a trigger item. If there is information who might be haunting the space, bring along something that may be of interest to the ghost, such as a child's toy, or a flower, or a favorite food. Challenge or confront the ghost, although not everyone is comfortable with this method. The Hampton Court ghost slams doors and returns inside the palace, but no one knows who -- or what -- she is. A New Mexico police station cannot explain who is walking through the building. Photographers may review thousands of images and videos and find only the usual orbs and streaks of light, but sometimes impressive examples of ghost photos turn up. Likewise, with good equipment, patience, and persistence, it may be possible to capture ghosts on camera.